Nearly five days after a 7.5 magnitude earthquake struck Papua New Guinea, the worst-hit regions remained largely cut off on Friday, with aid only just starting to arrive in some affected areas and the government declaring a state of emergency. The Red Cross estimated an initial 2000 people were in urgent need of emergency supplies, while Reuters reported that the death toll had climbed to 31 and would probably rise further. A state of emergency was declared in the provinces of Southern and Western Highlands, Hela and Enga, allowing extra funding to be released by neighbouring countries and aid organisations including the Red Cross. While the region has no major urban centres, around 670,000 people live within 100km of the epicentre, according to the Red Cross. Most of the other confirmed fatalities were in or around the provincial capital of Mendi and the town of Tari, 40km from the epicentre, where airports were closed and relief workers were yet to arrive on Friday. 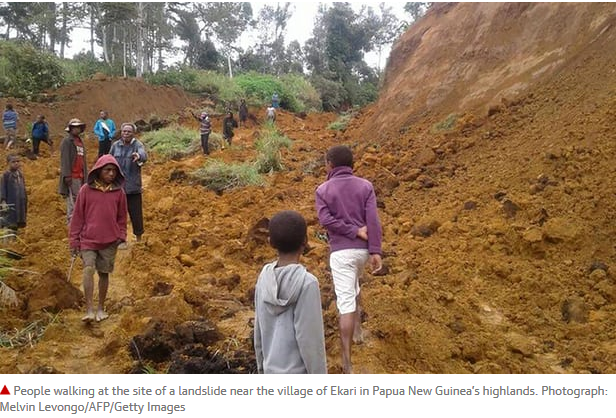 “Our people live in scattered hamlets and people are dying slowly – the only means of rescue is through helicopters and they are hardly coming,” Hela province’s administrator, William Bando, said from his office in a shipping container in Tari. The PNG prime minister, Peter O’Neill, called the earthquake “an unprecedented disaster” and said his government had released funding to restore essential public services such as healthcare, schools, roads, airports, power and communications. “Cabinet has further approved the establishment of a restoration authority that will manage long-term reconstruction efforts over a four-year period to fully restore normalcy,” O’Neill said. The United Nations Office for the Coordination of Humanitarian Affairs said it had recorded large landslips between Mount Hagen and Mendi, and the two main health facilities in the region had sustained quake damage. Access to clean water was scarce, and power and communications damage was widespread, with aftershocks expected to continue for weeks. “The strong, shallow earthquake damaged or destroyed communication networks and infrastructure, so there is limited information on how people were affected and what they need,” said Udaya Regmi, head of the Red Cross in PNG.